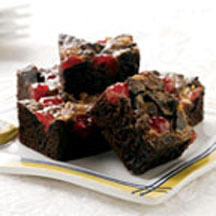 This chocolate brownie dessert will bring to mind a classic cake with roots in Germany. Mix brownie mix, eggs, water and oil in a large bowl until well blended. Spread batter in a 13x9-inch greased pan. Scatter top of batter with cookie pieces, cherries, chocolate chips and walnuts. Drizzle with condensed milk. Bake for about 35 minutes or until topping is golden. Let cool and then cut 4x4 into 16 pieces. Note: If using a glass baking pan, increase cooking time to 40 minutes.